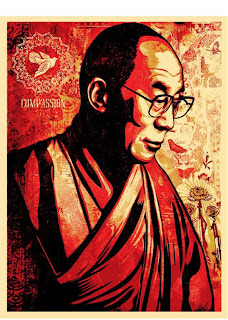 Illustrated obscurity: Happy Birthday, Dalai Lama! In honor of both, Shepard Fairey collaborated with photographer Don Farber on this limited-edition, signed and numbered 18"x14" print, which goes on sale at this link Wednesday, March 10, at noon Eastern/9am Pacific. Net proceeds divided between Tibet House and LA Friends of Tibet. Also, His Holiness now tweets.